Hills seem to naturally inspire worship hence some of them have shrines. The chief temple of Igguthappa is at Padi, near the small town of Kakkabe. The Igguthappa Betta of this area is called the dwelling of Igguthappa. This is the centre of Puttari, the annual harvest festival of Kodagu, since Igguthappa is especially remembered during that time of the year. He has the rights over the new crop. The story of the Yevva Makka Debuva (seven children gods) is a folk story which every Kodava has heard as a child. Legend has it that Igguthappa and his siblings came to earth for the good of the people. There are slight variations to the legend of Igguthappa and his six siblings. But the most common one will be narrated here. Seven demigods, six brothers and one sister, emerged from a large conch shell on a distant land across seven seas of the celestial milky ocean of Hindu folklore. They arrived as children upon the Northern Malabar coast. They came to be revered by the people despite being mere children because they had a divine aura about them. At first they came to the meadow and village of Madayi in the Malayala region (Kerala) where they lived for a while. Then they moved to the vicinity of the town of Tali Parambu. They halted in the nearby village of Kanjirath (Kanarat). This village on level ground had priests, drummers, flowers, banana trees and cattle. Pleased with the place the eldest brother, a reincarnation of Lord Vaidyanath, settled down there and became known as Kanjirathappa. Kanjirathappa sent his younger siblings further inland. But the second brother, a local manifestation of Sri Krishna, settled only a little distance away, at Thiruchambara, a village which he deemed suitable, and hence came to be known as Thiruchambaratappa. The third brother, a reincarnation of Lord Rajarajeshwara, came to live in Bendre Kolur, another appropriate village, and became known as Bendru Kolurappa or Marajendra (King) Kolurappa. Even today these three temples, in and around Tali Parambu town, are known as brother temples in Kerala. After the elder three siblings settled down in the Malabar itself the remaining four siblings moved on towards Kodagu. The four siblings were armed with bows and arrows and carried an earthen pot. The Brahmagiri hill jungles of the Western Ghats that border Kodagu on the south and the west pose as a natural barrier between Karnataka and Kerala. They are home to several species of flora and fauna. The four deities crossed the Western ghats en route into Kodagu. They passed Yermakutte poley (rivulet), Thondangund mott (hillock), Kannadi parambu (meadow), Irthkad poley, Manat parambu and other such landmarks towards Payyavur from where they moved on further ahead. They stopped and faced Baithur (today known as the villages of Vayathur and Ulikkal in Kerala and near Iritty town in Kannur district) to pay obeisance to Lord Baithurappa. Baithurappa was the guardian deity of Kodagu, known to protect the region at its southwestern entrance. The Baithurappa temple is called as Vayathur Kaliyar Mahadeva temple and is in Ulikkal in the present-day. The gods then crossed Udumbe poley, Eltha Kundu mott, Adake theri bakka (gateway) and entered Padi Thora (mountain pass). They had entered Nalnaad in Kodagu. Nalnaad, called Nalknad in Kannada, comprises of the four naad (counties) of Padi, Noorambada, Nelji and Perur and is in Western Kodagu. When they reached the edge of the Brahmagiri hill range of the Western Ghats they had a panoramic view of the land before them. Lead by Igguthappa the eldest among them, they arrived near a hill called Malma Betta. Near this hill was the Ambala poley stream. In the shadow and at the foot of this hill was the prominent village of Kakkabe. The four gods decided to have an archery contest among themselves. Igguthappa's arrow fell far but his sister's arrow went furthest. The brothers grew jealous and decided to teach her a lesson later on. However for now they were hungry. “Thangamma (sister), please cook food for us” the brothers requested their younger sister. But the sister fell into a quandary. “How can I cook food without a fire or rice?” she asked. “I will do so” agreed the sister who later added, “Only if all of you eat it without salt”. The brothers conceded to this. Igguthappa brought an earthen pot of rice before her. These siblings were on private family land. They were chided severely by Ummavva of that family for taking leaves off their banana plants. These banana leaves were to be used to eat meals upon. Igguthappa cursed the family property to henceforth not yield any plantain. Nambimada Muthanna was the Pattedar (elder) of Ummavva's family. Muthanna came to hear of the siblings camping upon his property and hence rushed to the place. When he came to know that they were divine people he paid them salutations. Igguthappa thereafter called Muthanna as Parada (searched), as he had searched for them. Muthanna was to eventually become the ancestor of the Pardanda family. They came to a meadow in Naaladi. The sister saw a cow, which belonged to the farmer Muthanna, grazing nearby. She milked the animal and poured the milk into the pot of rice. Meanwhile, the brothers fell asleep under the boughs of a tree. The goddess took the pot and buried it under the hot sands upon the bank of the Ambala stream. When the rice got cooked she took it out and called the brothers for lunch. The four ate till they were full. The fifth brother Palurappa, who detested the food, took some of the remaining rice and playfully flung it into the air. As it fell to the ground he spoke “Look how the hail stones fall from the sky”. Thangamma got angry when she saw how the food was being wasted. She took up the cooking ladle and hit him heavily on the back. “Look how the thunder strikes in the monsoons” she said. All the siblings laughed together. Hence even today when the people of Kodagu look up to the skies during a hail storm, they point at the hail stones and the thunderbolts. “See how the god has strewn food! See how his sister beats him!” they exclaim. The face of Palurappa's idol in his temple is turned left to show the impact of that noisy blow. Later, the four deities chewed upon betel leisurely. They spat out the betel unto their palms and compared whose chewed betel was reddest. Afterwards, the brothers flung the betel behind their necks. But the sister who liked to imitate her brothers presumed that they had put the chewed betel back into their mouths. So she did what she thought was likewise. The brothers who noticed this said it was very unmannerly to do so. They protested, they called it a disgusting act. It was commonly told that such an action, eating what was spat out, would make one lose their caste. They consulted with their three elder brothers who decreed that the sister would have to be separated from them. She wept bitterly upon hearing this and so Igguthappa pitied her. He decided that she was to live near where he lived so that he could look after her. Igguthappa then threw down an arrow from atop the hill. It struck a mango tree in the hamlet of Ponnangala in Yavakapadi village. Then he told his sister to go and settle down there. The sister took the form of a crane and flew down to the spot. Thereafter she became known as Ponnangalatamme. When the mountain top of Igguthappa Betta is covered with clouds the natives say that Igguthappa is gloomy and misty-eyed, thinking about his sister's separation. However the sister's casting out of the community actually had a greater purpose to be served. This way she was able to become a goddess of the poor. Muthanna had a temple built for Igguthappa near Malma betta (also called Igguthappa betta) to settle down in. This became the Padi Igguthappa temple. From Malme Betta Igguthappa first went to Ammangeri village near Nelji. Then he went to Nelji and Perur. Hence two other ancient Igguthappa temples came to be built near Padi, one at Nelji and the other at Peroor, by the local clans there. Nelji is said to be the place where rice was first grown and hence was initially named Nelachi or 'rice grew'. 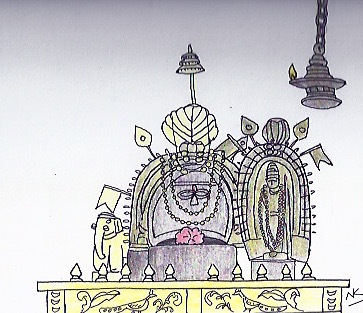 The elder among the remaining two gods was an avatar of Lord Mahalingeshwara. He settled down in the village of Palur along the river Kaveri and came to be known as Palurappa. Pemmayya, the last of the brothers, went south to the Brahmagiri hills dressed as a yogi. He met Chieftain Appa KongiBalu and crossed the Brahmagiri hill range. Pemmayya cured the Chief's wife of an unknown ailment by bringing a wild buffalo cow, a tigress and a she-bear, milking them in the palace and offering the mixture as medicine. He was thereafter allowed to settle down in Thirunelli, presently in Wayanad district, and his temple became known as the Janardhana temple, named after the deity whose avatar he was. The descendants of Muthanna, the Pardanda family, called the Padil Parada (the Parada of Padi), became the Deva Thakka, or hereditary managers of the Padi Igguthappa temple. The Pardanda were also one of eight Sime Thakkas, or regional chieftains, of Kodagu. The Baddanjettira family are Deva Thakka at Nelji Igguthappa. The Machchuda and the Mekmaniyanda families are Deva Thakka at the Peroor Igguthappa. The present-day priests of the Padi Igguthappa temple belong to the Hebbar Brahmin community. A number of families of astrologers, ritual performers and farmhands such as the Ammangeri Kaniya, the Ballatnad Maleya, the Kundu male Kudiya, the Payyanur Banna, the Chirammangala Panika, the Kandimakki Paley, the Kuttanjetira Poleya and the Aranoot Kapla, each of them connected to their respective villages, are also associated with the temple. In the precincts of Padi Igguthappa are the shrines of Aiyappa, Povvadiamma (also called Bhagwathy), Vishnu murthy and Baynadappa. Baynadappa, or Baynad Balwan, was a legendary man who came from Wayanad (also called Bayanad) to guard the Igguthappa shrine.